The Nicastro Family purchased the Wakefield Inn in May of 2013. Dino and Colleen were already part-time Wakefield, New Hampshire residents as of 2007 and had always hoped to make Wakefield their full time home once they retired. Colleen first visited the Wakefield Inn in 2010 when she attended a cooking class weekend hosted by the former owners. 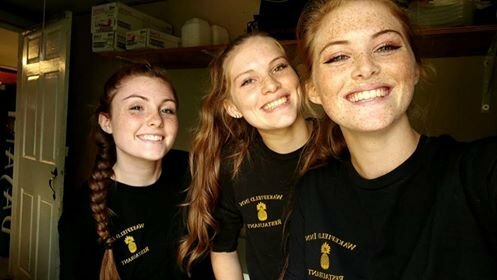 Colleen began following the Inn on FaceBook and when she learned that the Inn was going out of business, she approached her daughter Christina, who is a trained chef, and asked if she might be interested in running the Inn's restaurant, which had only been operated on a seasonal/sporadic basis for some time. Both her daughter and her husband looked at her like she was joking or maybe even crazy, but she was not! In February, 2013, Colleen spent the next many nights and weekends putting her MBA to the test. She reviewed the Inn's very sparse financials and quickly discovered that running the Inn as a Bed and Breakfast only, would not make good financial sense. She was determined to turn the business model upside down and run the Wakefield Inn primarily as a restaurant and secondarily as a B&B. Colleen was convinced that the local area could support a casual fine dining establishment and a bed & breakfast combination. She put her business plan together with help from a local realtor, the local bank, the local SBA office, the local economic development group and a local attorney and began the process of purchasing the real estate. There really wasn't much of a business to purchase as the Inn had been empty and not operating for close to a year. With everyone in the family mostly on board with the plan, the process to purchase the Wakefield Inn began and by May, 2013, only 3 months later, while the ink was still wet on the mortgage, the Nicastro family jumped right in and began the process of opening, not only the B&B, but a full-time, year-round restaurant as well. With a lot of help from friends and extended family, the Wakefield Inn & Restaurant opened to the public on June 15, 2013. Since that day, the support of the local Wakefield, New Hampshire community has been tremendous. On our actual first night in business, it looked as if we didn't have any business because there were no cars out front - our restaurant was full with our neighbors! How cool is that! Dino – a full-time Laborer out of Local #22 in Boston is mainly in charge of repairs, maintenance and whatever hefty work that needs to be taken care of. Dino can also be found washing pots and pans on any given Saturday night. Colleen - a full time business operations leader in the high tech industry. Colleen's favorite job is spending time with the grandchildren. She loves being referred to as the "cool Nonna". Christina – is the most important family member because she is our Chef! If you have already tasted Christina's fare, then you know what I am talking about. Christina graduated from Newbury College with her Bachelor's in Culinary Management. Christina's work experience ranges from pastry chef to food service director and everything in between. Nick – is our dining room manager who also moonlights as the groundskeeper and the snow removal expert. You can find Nick in the dining room yucking it up with the customers, providing superior service, every Thursday, Friday, Saturday and Sunday night. Vincenzo – is the extremely well adjusted 4 year old son of Christina and Nick and grandson of Nonna (Colleen) and Papa (Dino). During business hours, Vincenzo keeps his crew of babysitters very busy. Giocamo – our newest member of the family who ceremoniously arrived on February 12, 2015. Ask one of us for the story! Anthony, Renee & Serafina – are our southern NH family who visit when they can and are always with us in spirit! In this adventure of ours and let me tell you, it is a daily adventure, the dream of our family is to run our small, 3 generation, family business and provide a sense of community and friendship where our customers come into the restaurant, give hugs to the other patrons on the way to their table. For the Inn, we strive to provide a service, mostly seasonal, to the community by providing overflow accommodations for all of the homes and camps who just don't have the room for their guests. We always promise to take good care of their extended family and friends. We are proud to say that after 220 weeks in business, we have had a new customer every single week. Word of mouth is our best marketing tool! We couldn't be happier and look forward to growing and improving the business for many, many years to come. Other members of our Staff includes Skye, Ailey, Iona, Jillian, Brie, Caitlyn, Lydia and Anastasia, Skye and Ailey who we truly rely on to run our Inn and Restaurant. As many of you know, we lost our hostess Crystal in a tragic accident, however, we are all convinced that her spirit is with us each and every day.